Some of you may know that I like to tweak things. I admit it: I’m an improver. I need to retool, rework, and reorganize. Sometimes this behavior does not serve me well. (Okay, much of the time…) Sometimes, though, it needs to be done. We are trying hard to get a handle on Quinland’s education plan for the trip. Yes, we have been told by many that the trip should be education enough, she’ll get more out of it than she will out of school work, etc. We agree, believe it or not. However, we also want her to keep up with her Algebra class so she can move on in eighth grade, we want her to get the experience of writing her conflict paper for Mr. Wierth, we want her to learn about the history and culture of the countries we visit. We also want her to take Religion class. Yep – this is a Catholic homeschool. I’ve got a good religion textbook and I’m not afraid to use it. Quinland was shocked, but even she had to admit that we slack off too much on the Religious Ed materials we bring home from church. What we need to get a handle on, however, is our daily schedule. It became clear to us this week that doing a little bit of school each day is basically just going to waste a whole bunch of days. We are now going to try having school two-and-a-half days a week so that we get out into the city for longer periods of time. I think it will work out much better. For now, however, we decided to combine school and sightseeing. We walked up our street (taking our recycling up to the permanent recycling collection point at the top of our street) and past the Campo Santa Clara (home of the famous flea market) to the Miradouro da Graca. This is a well-known viewpoint with a panoramic view of the city and the castle. 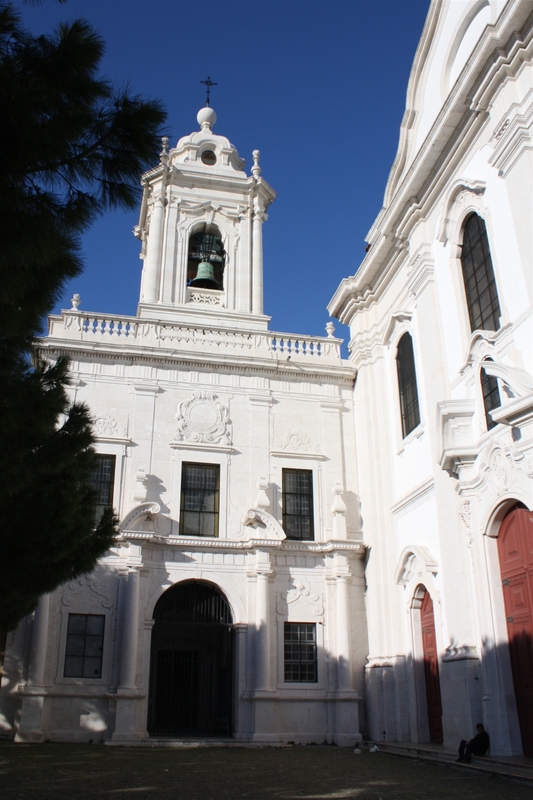 The church was built in 1271 and is one of the city’s oldest. We sat in the park next to the viewpoint and started on Chapter 1 of the Religion book. it was lovely to just sit and talk while Quinland sketched the fountain (and David got a few pictures of it). 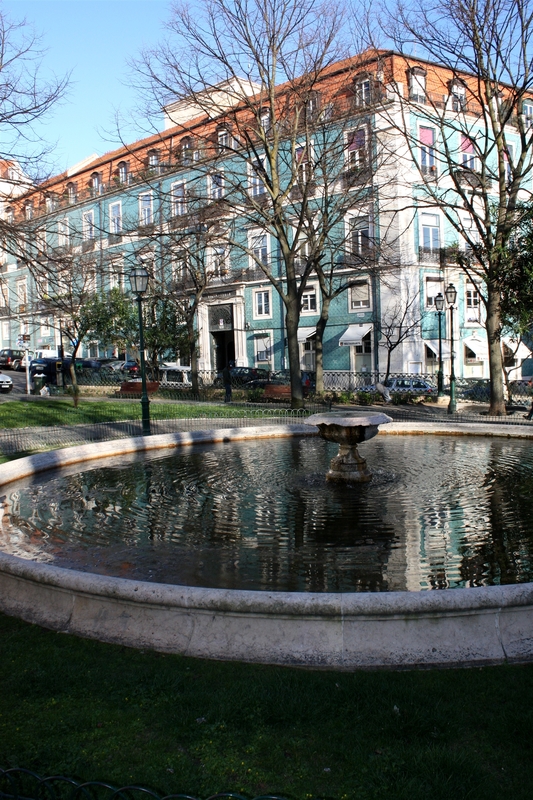 Fountain near Largo da Graca. The azulejos (tiles) on this building are such a beautiful color! 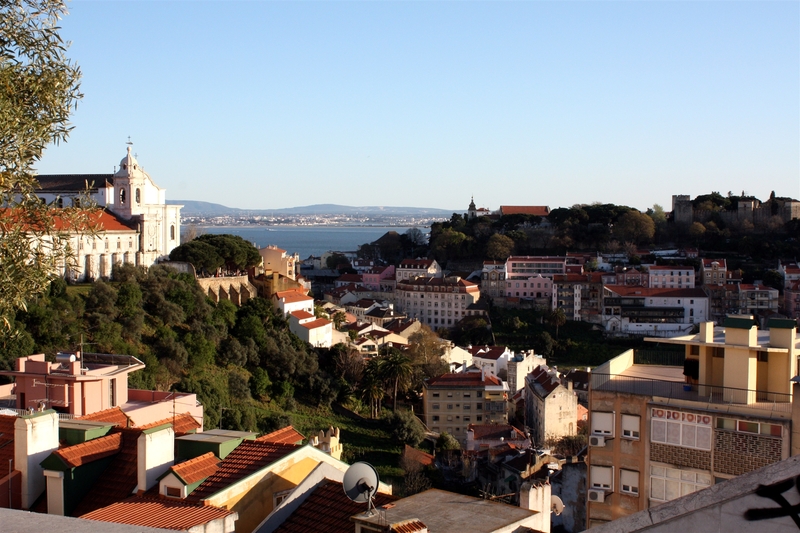 From there, we decided to walk over to the Miradouro da Nossa Senhora do Monte, which is the highest point in Lisbon. From here, you get a beautiful view of the Largo da Graca, where we just were. Looking back at Graca (church on the left) and the Castelo from the Miradouro da Nossa Senhora do Monte. We woke up around 10, had a very late dinner, Q skyped with lovely Hannah, and then I sent her off to sleep. I, on the other hand, was all wired and hopped back on the computer to blog. It has been very difficult to get accustomed to sharing a computer three ways, especially late at night. At home, after Quinland goes to bed, David and I often take care of our respective online business – I, blogging; David, going to BGG, both of us checking email. Here, we all want to do those things whenever we have down time. It’s less than ideal. Expenditures: Cough syrup at the farmacia. Experiences: My first time up at the Largo da Graca viewpoint; our shared first time up at the Nossa Senhora do Monte viewpoint. Love the photos. 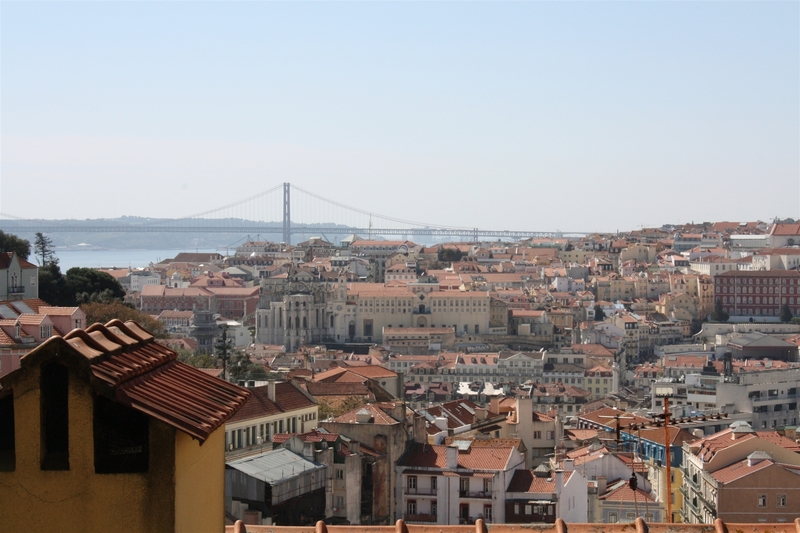 Lisbon looks beautiful. Q will have a great knowledge of european history, if he learns some history of each country that you visit.